There is now a date for the legal hearings regarding our local NHS services. On February 8th (and possibly 9th) at the Royal courts of Justice in London (on the Strand), lawyers will argue whether there is a case for a Judicial Review, and if the Judge agrees, one will proceed immediately (this is called a "rolled together" hearing). The outcome of the Judicial Review, if it takes place, will not necessarily save our NHS services from privatisation. We will need to campaign vigorously to make sure our NHS services remain public even if we win the case. Below is the press release from Stroud Against the Cuts - see also the video I edited here on the talk by Prof Wendy Savage. 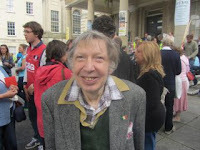 The Judicial Review that Stroud resident, Michael Lloyd (supported by Stroud Against The Cuts) is pursuing, opposing the transfer of 9 Gloucestershire community hospitals, including Stroud General, 10 health clinics and other county wide services and staff out of the NHS and into a Social Enterprise or Community Interest Company called Gloucestershire Care Services[i], is due to be heard on February 8th. If the Judicial Review is successful, it means the court will have decided that the process of transferring Gloucestershire’s health services out of the NHS and into a Community Interest Company was illegal and will have to be restarted. The management of NHS Gloucestershire will be faced with a choice concerning Gloucestershire’s community health services. They can either decide to try and outsource services or they can pursue various NHS options open to them. [ii] Outside the South West the most common model for community services is merger with other NHS Trusts. “We’re pleased that the idea of moving health services out of the NHS is now going to get legal scrutiny. We encourage anyone who is interested in our campaign to look at our website www.stroudagainstcuts.co.uk, and to attend events we will be organising in the near future”, added James Beecher. [i] Without the legal challenge, Stroud General Hospital, Beeches Green health clinic and other community hospitals, health clinics and services in Gloucestershire would have been transferred to a private limited company outside the NHS. The services affected include District Nursing, Occupational Therapy, Physiotherapy, Specialist Nursing, Out of hours medical and nursing services, Pharmacy, Sexual Health and Chlamydia screening, Podiatry, Dental services, Wheelchair services, Musculo-skeletal services, Telehealth and Specialist Domiciliary care are also to be transferred to Gloucestershire Care Services Community Interest Company. Nine community hospitals (Stroud, Cirencester, Dilke, Fairford, Lydney, Bourton (Moore Cottage), Moreton, Tewkesbury, and the new Vale Hospital in Dursley) and nine health clinics (Beeches Green Stroud, Stonehouse Health Clinic, Cinderford Health Centre, Coleford Health Centre, Lydney Health Centre, Hesters Way Healthy Living Centre, Holts Health Centre Newent, Lydbrook Health Centre, Symn Lane Clinic (Wotton-under-Edge)) are also part of the plans. [ii] NHS Gloucestershire could retain the services in house, as is happening in Devon. Alternatively, they could set up a standalone community NHS Trust, or transfer services to another NHS body, such as the 2gether Trust, both of which are routes which have been pursued elsewhere in the country. [iv] In September, Central Surrey Health – a flagship healthcare social enterprise – lost out on a £500 million contract to Assura Medical, a private healthcare company 75% owned by Virgin Central Surrey Health story see: http://www.ft.com/cms/s/0/8e187d7c-e2cc-11e0-93d9-00144feabdc0.html#ixzz1YaQCdKWz and http://www.guardian.co.uk/society/patrick-butler-cuts-blog/2011/sep/19/social-enterprise-big-society-gets-reality-check. [v] The current list of signatories to an Open Letter written to the PCT by SATC includes:Dr. S. G. Subbuswamy, Gloucestershire County Councillor Steve McHale (Leader of the GCC Labour group), Gloucestershire County Cllr Brian Oosthuysen, Gloucestershire County Cllr Sarah Lunnon, Gloucestershire County Cllr Sonia Friend, Stroud District Cllr Philip Booth, Stroud District Cllr Molly Scott Cato, Stroud District Cllr Catherine Farrell, Stroud District Cllr Simon Pickering, Stroud District Cllr Martin Whiteside, Stroud District Cllr Simon Pickering, Stroud District Cllr Geoff Wheeler, Stroud District Cllr Paul Denny, and Steve Lydon, Chair, Stroud Constituency Labour Party.